My biggest problem with the iPhone is that it's on the AT&T network. That's why I got the MiFi from Verizon - I use it all the time. 1. Reconsider your network (if you can). C.D.M.A (Verizon) uses more power than a G.S.M. network (AT&T and T-Mobile). Perhaps T-Mobile would work. AT&T saves you power by dropping your calls (in my experience – not sure that's actually their strategy). 2. Dim It. Turn down the brightness of your screen, save power. 3. Stop Searching. Turn off Wi-Fi and headset features when you're not using them as your device will continue to search for them. You can also put your phone to sleep when you are in standby mode. Go to "settings" on the iPhone, "Manage Connections" on your BlackBerry. 4. Skip a Generation. If your G.S.M. 3G network is not available or the signal is weak, the battery will drain looking for it. Consider turning off 3G. If all signals are weak, turn off mobile capabilities to save power until you reach a better cell location. 5. Check Mail Manually. Turning off auto-checks every "X" minutes or "push" technology will save power. 6. Turn Off Everything. Put your phone into "airplane mode." It turns your phone into a music player and personal organizer. 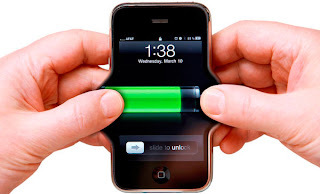 No emails or calls, but your battery will last longer. “In airplane mode and running just the alarm clock, your iPhone battery will last up to a week,” said Kyle Wiens, co-founder of ifixit.com. 7. Disable the Animations. One of the biggest users of power is Flash animation. If your device has Flash, you can disable it to save power. 8. Get an App to Aid You. Battery Go and myBatteryLife tell iPhone owners how much charge they have left and how that power translates into minutes of talk time, music, video and Web surfing.